Last night after dinner I asked Tim's help with the tomatoes. They are a tangled mass of stems and green tomatoes. I can't tell which branch belongs to which plant. The cages have fallen over with the weight of the growth and the tomatoes. So we spent some time tying everything up. This morning I went out to cut a bouquet for the house. Several years ago I moved the phlox from the front to the back, but it's a persistent perennial and there are several stalks growing where they shouldn't. I cut them down this morning and added some hydrangea to the vase. Three years ago we planted an apricot tree. In our climate it needs full rain cover, so it shares a roof with the lemon tree. This is the first year we are enjoying apricots and are they ever good. It's the height of luxury to pick a perfectly ripened apricot and bite into its juicy, sweet warmth right there in the garden. The backyard, transplanted phlox is blooming madly. I love the bright white against the cedar hedge behind it. I've spoken sternly to the squashes, pumpkins, beans, cucumbers and tomatoes but, like an unruly class, they are not listening at all. The Butternut and Hubbard squashes are spilling out either side of their bed and are heading towards the bean trellis. The Princess Pumpkin is really acting like a princess and invading the tomato bed. Cucumbers spill into the walkway. The quinoa (a new plant for me) is threatening to overtake the bean tower in height. I showed it to my daughter via Skype, then set it on the coffee table, where it rolled off onto my foot. It hurt! A zucchini weapon. I could be cutting and trimming and weeding, instead, I'm ignoring it all. I read an article that growth is extra-luxuriant this year because of the heat. Instead, I clipped a few herbs and arranged them in a crystal vase for my kitchen windowsill. The white blur at the top - that's the phlox. But the zucchini isn't going away on its own. What would you do with a 6.2 pound zucchini? And its smaller relatives? Sorry, but I would hand it over to someone else, leave it on the step with a note saying 'Please eat', or even bury the beast! Smaller ones I would roast with onions and peppers and freeze, but large ones seem to be full of seeds and tasteless. My tomatoes are just about to turn red, then it's busy time. And, huge success, I have grown a cucumber and we are picking from it. It's the first time! When a child (and a meat eater) my Auntie Madge in England would welcome me for my annual Summer holiday at her home with what she called 'stuffed marrow' - and I loved it! It was huge and green so perhaps a very large courgette as they call them in Europe. She would stuff if with a mixture of meat, crumbs, herbs etc., like you would stuff peppers I guess, and bake it. I loved it and have done a veggie stuffing in small zucchinis which you might want to try with your big boy!!! If not, your compost pile, if you have one, will enjoy it I'm sure, haha! Lovely garden this year Lorrie - you must have a green thumb - along with great weather, lucky you! Oh for a fresh apricot, just picked and warm from the sun - they look fabulous. That's how I garden. I tend it early spring but when it is hot I ignore it, except on the nice days when I want to get outdoors. The apricots are mouth watering! Your garden is so very impressive! I always think the trick with zucchini is to grab them before they get beyond 8 inches, at which point they're still delicious grilled or sautéed or raw with a healthy dip or as fridge pickles or whatever. But easier said than done, right? We don't have any although we do have any number of patty pan squash and finally some cucumbers. Tomatoes are ever so much earlier than usual -- 6 more weeks of them ripening, at least. Astonishing! And mmmmmmm to that apricot, sun-warmed, fabulous! The blue hydrangeas are such a gorgeous colour! Your garden is looking wonderfully productive. Maybe stuff the zucchini with a spicy filling and bake it?? We used to do stuffed marrow like that when there was a glut of marrows at harvest time over here. How lovely to have your very own apricots to pick...delicious! Lorrie, your garden looks wonderful. You have worked hard to get your soil just right. Don't worry about the weeds. As long as your vegetables are producing you have it made. I envy you your beautiful apricots. Ours froze early in the year. When I have too many vegetables I put them in a box and take them to the end of our lane with a sign that says FREE. If that doesn't work then everything goes to the pig farmer down the road. I think I'm beginning to realize that you are not an average gardener. And I don't think the heat this summer explains it all, I think you have got to be putting some expert time in this garden for it to produce so lushly. Oh, the apricots would be heavenly to have! Oh my, you are the garden queen! I can barely get a flower to grow.... :) Your garden is truly amazing, Lorrie, and what a blessing! Your zucchini story is one told many times and I think unsuspecting neighbours do find them on their doorstep. The container variety I grew this year is much more manageable and smaller in size. Looks like there will be lots of garden to table veggies for dinner at your house. The fresh apricots sound good. Oh my look at your amazing garden. It is so full and lush. Growing up in southern California we had apricot trees in our back yards. What a treat it was to pick and eat them right off the tree. I really enjoy apricots. My mother made the best apricot pastries! You are blessed with a bounty of fruits flowers and vegetables...all looking healthy and happy in your garden. It's nice to take a day off from weeding and working and to enjoy the fruits of your labour! I just bought a nifty gadget that makes veggies into noodle shapes. I used zucchini in my alfredo chicken and it was amazing! I may never do pasta again! Our tomatoes are out of control too! We are enjoying what we are getting, though! hahaha!!!!!! I loved this whole post, especially how you talk to the unruly vegetables that are NOT behaving. How would I use the zucchini? As a weapon, of course, and it would be especially effective if hurled. WHAP! Hi...lost two. I think I see what happens, but I'll not discuss here. What abundance! Guess we need some heat because my little zucchini is clinging for all it is worth. I can't imagine it ever weighing six pounds. What would I do? Slice it in half, brush with olive oil and slap it on the grill. Then I'd salt it with sea salt and freshly ground pepper and serve it to a crowd of sixty. I have a fabulous recipe for sweet pickle relish - I use the giant zucchini for it instead of cucumbers and it is a favorite of family and friends. I can't make enough jars,someone is always stopping by for "just one more jar of the relish this season" - and of course I'm happy to oblige. I cut the zucchini in half the long ways - then cut those in half again - and scoop out all the seeds (the seed area is kind of mushy in these big ones) - then grind the zucchini in small batches in my food processor. I also grind up onions and sometimes green peppers to add to the zucchini - and that is the start of the relish. If you'd like the recipe,let me know - it is super delicious and easy to make. Everyone is happy to give me their "whale" zucchini to make relish, so even though I don't grow any, I have plenty for making the relish. Your flowers are beautiful - and the garden sounds wonderful, even with the unruly tomatoes and their friends. I should have planted tomatoes on the deck this summer - it is not usually warm enough here because of the woods across the street. Oh well, I can get great organic ones from the farm stand in town. The hydrangea and phlox bouquet is gorgeous, Lorrie, and the all the produce you grow is wonderful. To have fruit trees and vegetables would lead to a bounty of fresh-picked goodness for goodness. I placed a moratorium on zucchini a few years ago, but they are back. Actually they are one of my stir fry faves on the grill, even the big ones. Or pulverize the thing and make zucchini bread. I do admire your ability to grow hydrangea. Your vase is beautiful. Sounds like an amazing garden. So much work, I admire those who enjoy gardening like that. Zukkie bread...I shred it all and freeze it...and does it ever come in handy in the winter, for stews, and chili, and of course bread. LOL. Send some over, despite the heat I have yet to get any homegrown...or you can pop them into open vehicle windows...serves people right for not closing them up tight. Lorrie your potager is delightful full of summer's bounty. 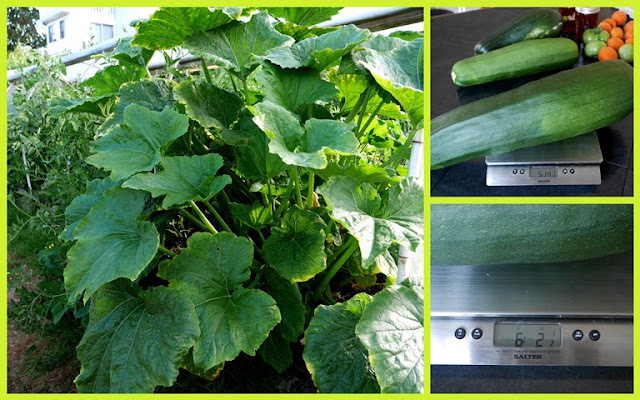 I really can symapthise with the glut of courgettes you've got a whopper there! Here's a link to my Pinterest "what to do with courgettes" board, maybe you'll find a recipe there for your monster!. I used to live surrounded by an apricot orchard in CA - nothing beats picking them right off the tree! A garden behaving badly, that is a first :-) But it sure photographs beautifully, and what a bounty! We are having these huge zucchini's too! Like your garden going wild, our garden also has gotten out of control. I need to get out there and whip it into shape. Our tomatoes are just now beginning to ripen and I can't wait for the plums, figs, and grapes. Oh what I would give for apricots in the garden too. I am so surprised they do well for you. Everything looks green, lush and vibrant over there! I'm guessing you have done a lot of watering. The 6.2 pound zuchinni would make many zucchin loaves...and the smaller relatives would be perfect in the Sweet Corn and Zucchini Pie we have been enjoying over here lately. You must have a good deal of rain too to make a garden so luxurious looking! And the flowers look to be abundant as well. Such a beautiful arrangement of herbs in your crystal vase!